Towards the end of the great war, feature film production started in Bengal. The female roles were played by men to start with and later, women joined the stage and films. These women were either Anglo-Indians, who took up the profession willingly or else they were brought from the red light areas of Calcutta. Film acting being considered undignified, womenfolk from respectable families would not dream of acting in public (although plays were staged by advanced families for selected audiences, notably the Tagore family). Film makers depended heavily on the nautch girls to do the female roles. Men like Dhirendranath Ganguly (D.G. as he was better known ) and Dada Saheb Phalke of course got their wives and daughters to act in films). KANAN’s roots were also outside the society. It is now proved that her first record was published from HMV. 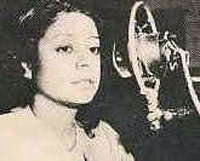 Who exactly groomed her in those days is something that we will probably never know, but some researchers have named Ascharmoyee Dassi for her earliest songs. There was also one Bholada –a well wisher who taught KANAN many songs. KANAN’s training from Allah Rakha happened at a later date when she was capable of appoining a teacher at her own expense. However, contrary to popular belief this Allah Rakha was not any famous ustaad from Lucknow, but an unknown music teacher from Calcutta. 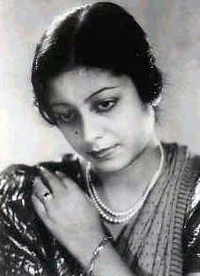 KANAN was brought to films by Shri Tulsi Banerjee, her first film being JOYDEB (1926) as a child artiste. She next appeared in SHANKARACHARYA (1927), but in such a small role that she went uncredited. Her next film appearance was in the talkie JORE BARAT (1931). She could not afford to be idle for all these four or five years. Her musical talents were discovered from the notorious Gholadanga area of Howrah by someone whose exact identity can never be known today, but Hiren Bose can perhaps be credited as her first real trainer. After shifting between HMV, Columbia and Megaphone for a while, she was finally given shelter at Megaphone by Shri J.N. Ghosh, the only person in the film and music world whom she called BABA (meaning father). She was given a separate room for living and singing and here maestros like Kaji Najrul Islam, Vishmabeb Chattopadhyay, Gyan Datta and Binode Behari Ganguly became her regular trainers. Music lessons apart, Shri J.N.Ghosh engaged a teacher, Mrs Gabbey for KANAN to learn English. She started recording discs right from the beginning of Megaphone Company and in fact the fifth record (JNG 5) published by the company had KANAN’S songs.